You know the old saying "there's more than one way to skin a cat"? Yeah, grizzly. I don't get it either. I don't see the point in skinning cats. There are more than one way to train a dog. Certain breeds have the reputation of not being very bright to put it kindly. Not pointing at a breed, I'd say that comes more from the one holding the leash than the one at the other end of it. They can all be trained. Some will take to it faster than others. How about that? Again, a lot of it has to do with the human and their techniques. It also comes from how well the person doing the training "learns" the cues that the dogs are giving them. Bulldogs are well known to be more stubborn, Herding Breeds like the McNab Dog are well known to be easier to train than others. But the wrong technique will end up with a shut down dog or a rebellious one. When you have a fearful dog, the rule book should be flipped upside down on its ear. Negative Training techniques just are not effective. They tend to create more problems than they solve. That's my belief so I do concentrate on Positive Training - reward for good behavior, and Neutral Training. What I mean by Neutral Training could also be called Passive-Aggressive I suspect. You aren't going to be able to do something because I simply won't allow you the opportunity. Rack hides. Constantly. If I am home and not going in and out of the house, I may not see my dog for hours. Not that he's sleeping, he's just curled up in a ball behind a piece of furniture. If you are thinking "why is he bothered by that?" you aren't looking at the whole picture. Dogs are social. They WANT to be with you and that is why we keep them in our homes. But if they're so shut down by fear that they feel that they need to be away from you, they won't grow. So I moved the couch. There's a corner, more of a dead spot, in my living room. It has a tall square table with an inlaid chess board. Nice thing, it was hand made and given to us a while back. But it creates a dead zone for the dog to hide. Next to that is the Big Green Chair, my own recliner. What Rack was doing was to first hide under the chess table. That wasn't enough cover apparently because we found him hiding behind the recliner. If you sit on a recliner, it will change position. Put a dog's paw in the wrong spot and ... YELP! You get the picture. It's a safety hazard. So I put boxes back there and it helped me hide the Hurricane Food as well as the overshopping we do to "catch the deals". He can't get behind the chair. Next we filled the area under the chess table. That pushed him forward to next to the big green chair, but it still was mostly out of sight and not very social. When I am sitting in the big green chair, that's fine. I drape my arm over the side and I can reach Rack and give him the tummy rubs he wants. When I am not sitting there, we found other ways to manage his hiding. The routine first thing in the morning is to slide the couch next to the chair to close off the area. Since he isn't allowed on the furniture, he is forced to be out in the room. His mats and his bedding are in the middle of the living room and his crate is in there with him. He has "dog" places to be where he can escape to when he needs to. At least now I know I have a dog who isn't stuffed inside a spot where he could get hurt. He's adjusting. 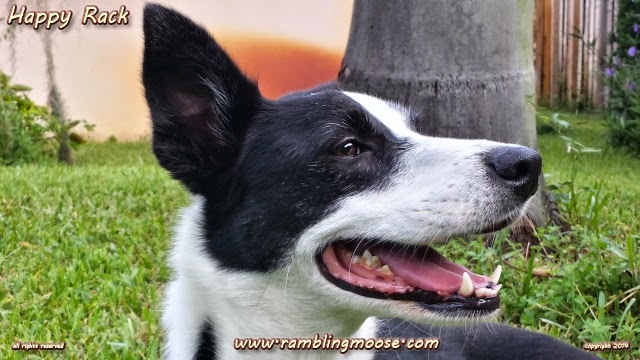 Intelligent dogs, herding breeds especially, need mental stimulation and challenges. Now he's getting them by actually being out in the open when that big bad trash truck comes by on Tuesday and Friday mornings. He's getting challenged by being out there in the open living room when the neighbors are getting the grass cut and there are teams of workers on the street. He may not like it but this is the way it is until it is time to use the chair ourselves at night after dinner. When we're in the chairs, the couch gets moved away from them and Rack dives back into the corner next to the Big Green Chair and the chess table. The key is to get him used to what he doesn't like, but in small doses like those allergy shots you got when you were a kid. The shots may have worked, they built up an immunity to whatever it was, but it did take time. In his own way, Rack is slowly adjusting. When I had my previous dog, Lettie, she had a similar problem with any loud vehicle. I lived a block from a very busy shopping district. On weekends I would take her there and sit and wait for the 23 Bus to go up or down Germantown Avenue in Chestnut Hill, Philadelphia. For a while, we were a fixture near Highland and Germantown. There was a pair of benches. One near Kilian's Hardware was my favorite, another was a half block down the hill right next to the entry to the parking lot. I would sit and watch traffic, meet the neighbors, and watch for busses. Lettie would love to meet the people, but hated the cars and trucks. She stayed with me where she belonged. Eventually we realized this wasn't necessary. She would still cast an evil eye at the 23 Bus when we were out for walks. She'd watch the trash truck or the semi delivering food to the restaurants, but she didn't try to run from the noise. She was cured. It simply took time. Fear in dogs simply takes time - most likely longer than you might think is appropriate. Just like in a human, you have to get used to new and scary. You may just learn to like it. Lettie did. She became "bulletproof" in those situations. When we moved her here to South Florida, she became the "Canine Ambassador to Snowbirds" on Wilton Drive despite traffic. Rack will learn too. I may just have to bring a lawn chair and sit with him out on The Drive, but we'll get there. I'll do my Positive Training best to make sure of it. Just bring cookies. Dogs love the right kind of cookies.